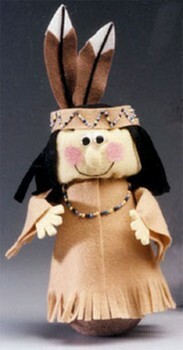 Share your Thanksgiving with this Native American wobbler from Styrofoam Crafts. 2. Refer to diagram to cut top 4″ from foam cone. Mark a line around cone 5″ from base. Indent cone on line by pressing foam onto square edge of a counter or table. Note: This will become the neck. 3. Refer to diagram to hollow out lower 5″ of cone and one half ball by scooping out foam with a tablespoon. Leave approx. 1/4″-1/2″ outer shell intact, working carefully to avoid cracking foam. If desired, paint bottom 1″ of cone and half ball tan to match robe. 4. Cut white chenille stem in half. Using pattern, cut two hands from flesh felt. Glue hands to matching felt, sandwiching a chenille stem between layers. Let dry and then cut out hands, cutting around original shapes. 5. Cut out remaining patterns as indicated. Also cut one 12″ x 4″ strip from flesh felt for head, one 12″ x 4″ strip from black felt for hair, and one 12″ x 3/4″ strip from tan felt for headband. 6. Glue a white tip to top of each brown feather, overlapping pieces approximately 1/8″. Glue a black chenille stem vertically to center front of each assembled feather, letting it extend slightly at bottom. 7. Gather felt nose close to edge, stuffing firmly with excess flesh felt before closing. To gather felt throughout, use a large-eye needle with fine-gauge wire and hand sew gathering stitches where indicated. Gather felt on wire and then twist wires together to secure. Trim excess wire. 8. Glue nose to center of 12″ x 4″ head. Paint pink round cheeks on either side of nose. Draw a curved smile with black dimensional paint between cheeks. Allow to dry. Overlap sides of head 1/4″ as indicated on pattern with facial features to inside and glue to form a tube. Turn. 9. Overlap one side of felt robes 1/4″ and glue to form one long piece. Fold each sleeve and glue where indicated on pattern. Fringe bottom of robe and each sleeve, cutting slits approximately 1/4″ apart. Squeeze dots of assorted dimensional paints side by side to create a beaded zigzag pattern on headband and necklace on top front of robe (see photo). Allow to dry. 10. Following pattern, glue sides of robe to form tube with painted pattern to inside. Turn. 11. Insert a chenille stem arm into each sleeve with wide end overlapping hand slightly. Gather each sleeve around arm 1/4″ from top. 12. Place head on cone with bottom of felt 1/4″ below indented neck. Gather head around neck. Place robe on cone with top edge overlapping bottom of head and painted necklace centered below face. Gather robe around neck. 13. Stuff head with fiberfill between foam and felt to give it a round appearance. Gather head 1/4″ from top around cone. 14. Use an awl or ice pick to form tiny holes in robe and foam body at shoulders to attach arms. Glue arms into holes with fringe at bottom. 15. Fringe 12″ x 4″ black hair strip, cutting deep slits approximately 1/4″ apart across entire length. Cut a circle from remaining black felt to cover top of head. Glue fringed hair around top of head and then circle on top, trimming each as necessary. 16. Glue headband to head, overlapping ends at center back. Glue base of feathers to top back of head, tucking ends under headband. 17. Turn cone body on end and weight hollow area with glass marbles. Align hollow half ball on bottom of cone with flat sides together and pin in place temporarily. Test figure’s rocking motion, adding or subtracting marbles as necessary. When satisfied, remove pins and glue ball to cone permanently.